6-24-10 Field Report Brian Castellano I've only been out twice since the 1st week of June. Between the weather and work, it's been tough. This past Monday 2 of us fished Red Lake from 10-12:15, then the lightning and rain chased us off the lake. We only hit one spot, that had rocks on it, 8-13 feet, and it produced about 30-40 walleyes, most of which were small. We did end up keeping 8, but nothing to get too fired up about. Bright jigs and minnows were the ticket. We caught a couple of fish and dropped anchor and jigged. 6-14-2010 fishing report - Fishing has been good for the most part on all area lakes with the best bite being early morning and late evening. Bill and I spend the evening on Bowstring last night. We started with a jig and a minnow out on the humps with a few little pike and perch as a result. We then switched over to rigs with leeches and crawlers and ended getting three nice 18 inch walleyes in just a few minutes. 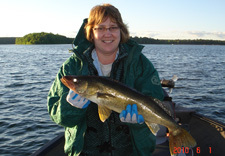 The majority of the walleyes are being caught on the humps with leeches and crawlers. There is still a jig and minnow bite on the cloudy days. The spottail shiners are about done for the summer meaning its time to start rigging. The panfish bite has been depending on the day. If the weather is sunny the bluegills and crappies will be up in the shallow in the weeds. Most of the perch are being caught along with the walleyes either on smaller leeches or medium fatheads. I have not heard much of a northern pike report except of the few being caught with the walleyes. Muskie season has been open for a little over a week and the few guys that are putting in the hours are seeing and boating some fish. I have not heard of any 50 inchers yet. - Chester Powell - Freds Bait. Fishing Update, Field Report 6-8-2010 Brian Castellano Mary and I camped at Onegume this past week, the 1st-4th. Crappie fishing was outstanding and we probably caught 60 crappies in the 4-5 hours that we fished for them. They were still up shallow spawning. The gills were just starting to push shallow. We didn't do alot of walleye fishing but we did do some slip bobber fishing in the evenings between Battle and Seelye Point. Leeches and chubs both produced fish, but all of the fish were either too big or too small. In talking to people who fished the big lake, it sounded like the fish are scattered all over the place, but the jig/shiner combo is still the ticket for the most part. Although leeches and crawlers were starting to produce some fish. It sounded like a good crank bait bite in the shallows during the morning and evenings. Fishing Update, Field Report 6-1-2010 Brian Castellano - After my long week of work I was finally able to get back on the water. 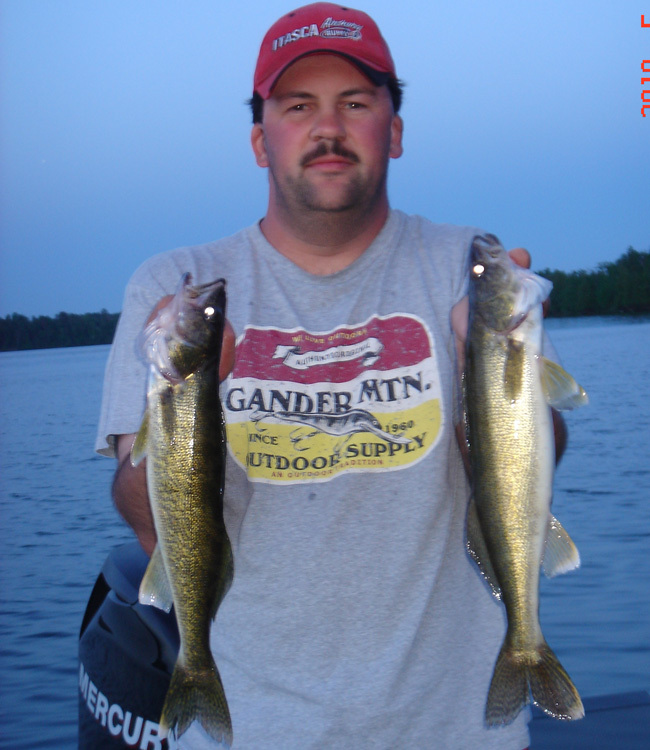 Friday I was on Sand Lake and the walleyes were biting! There was a good walleye chop blowing into the weedline and the 'eyes had the feed bag on. The best bite was in 7-9 feet of water, in the newly emerging weeds. It seemed like black or plain lead head colored jigs helped to deter the northerns. I ended up w/ 6 nice walleyes and threw back a couple more. I also brought home some jumbo perch that were mixed in with the walleyes. I also caught a bunch of nice gills that were up in the pencil reeds getting ready to spawn. Saturday my wife and I hit Wabana for the bass opener. We love fishing this lake because you just never know what you'll have on the end of your line when you get a bite. The water temps were at 67 and we didn't find many bass or gills up shallow. They were hanging on the sharp, deep drops that were close to the edges of the lily pads. It wasn't the gangbusters fishing that we're used to out there. Towards evening we anchored up on a shoreline spot that we had graphed some fish on earlier. Mary fished a slip bobber and a shiner and I jigged with a shiner. We ended up with 6 nice walleyes, including the 2 17-18"ers in the pic. Wed. We had about 10 boats up on Winnie from 8-3. It was a tough bite with flat lake and sunny, cloudless skies. Most boats ended up a w/ a couple eaters and of course there's always one boat that hammers them. They were fishing down by Highbanks. Thurs. we had 3 boats on Leech out of Federal Dam from 8-2. The weather was a repeat of Wed. weather and again a tough bite. My boat ended up w/ 4 nice slot fish 21-24 " by trolling small shiner colored shad raps in 9-10' of water. We caught these fish the last hours that we fished. I have a feeling the evening bite would have been really good as we graphed alot of fish and bait in 14-18' of water. I'm sure they moved up later in the evening. Water temps are in the low 60's on both lakes and the water is really clear, especially when there's no wind.Back to work for a week now, so I won't be out much, but plan on sneaking out a night or two to Moose or Deer. 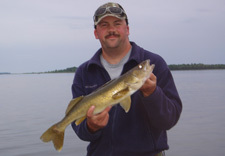 - Brian C.
Fishing Update, Field Report 5-18-2010 Brian Castellano I hit Moose Lake Sat. night from 7-10 pm w/ 2 buddies. Water temps were around 54 and we caught 13 'eyes. Only a coule of keepers and most were fat 12 inchers that hopefully will get a chance to grow up. The east public access is SHALLOW! You might be able to get a smaller boat out there, but I'd definitely bring chest waders. The South access by Voigts is in good shape. Sunday night 2 of us hit Deer Lake. Water temps around 50-52 degrees. We got the big 0, but my buddy had a good day out there Saturday morning. The access on Deer is good to go, I was worried about the mouth of the access bay, but it's good, still have to watch those rocks though. Monday 2 of us fished for crappies from 10-3. We found them up in the junk, but pretty scattered, lots of moving to scratch out our limits. We ended up w/ 20 9-11" and 2 bonus bull gills 9-10". Water temps up shallow were around 62 degrees. Mostly those black males w/ a few females mixed in. The females were still full of spawn. I'm getting some "honey do's" done today and hitting Winnie/Cutfoot the next 2 days. I've heard mixed reports out there, but overall it seems people are getting some fish in the 12-18' range w/ jig/shiner. 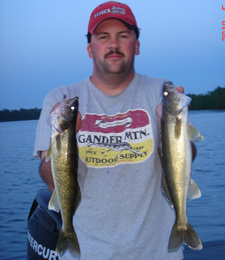 Jigging and slip bobber fishing with Shiners on the weedline brought in these chuncky Walleyes. A good day for Dave Donnelly Caught 15, kept 6 and 1 perch. Buzz Burgess with a nice opening weekend Walleye.